Who Controls Mali? Answer: The Rebels Fighting The Rebels : The Two-Way A counter-coup staged by supporters of the ousted president of Mali failed and junta leaders kept control of the capital. The junta only controls a third of Mali; the remainder is held by ethnic Tuareg and Islamist rebels. A report alleges Tuareg rebels are committing horrific human rights abuses. Soldiers loyal to junta leaders in Mali load their weapons, including a machine gun, onto a taxi after leaving a military camp where anti-junta forces were subdued. Reports from the west African nation, Mali, say this week's counter-coup attempt failed against the junta that toppled Mali's democratically elected president. Guards loyal to ousted Malian president Toumani Toure fought with junta soldiers in Bamako, Mali's capital, on Monday before junta troops grabbed control of the presidential guard barracks today, according to Reuters. 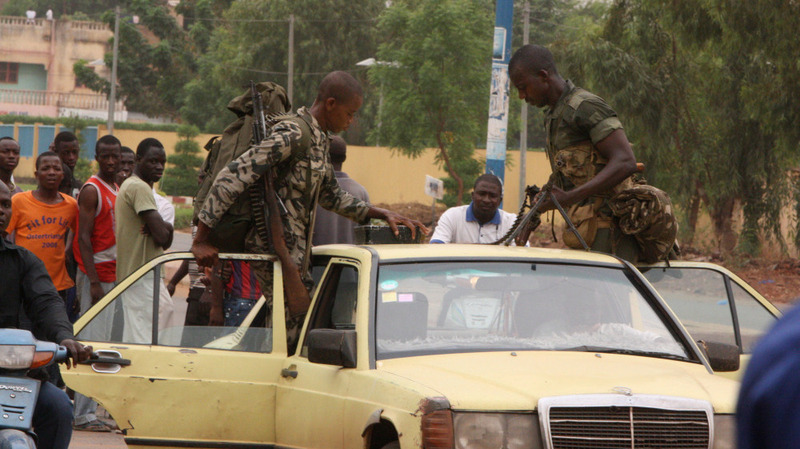 Junta leader Captain Amadou Sanogo accused "mercenaries from elsewhere" of plotting the attack. AP says fighting broke out at the airport, at the junta headquarters and at the state broadcast building. The Malian coup occurred March 22 and was condemned internationally; the Economic Community of West African States, or ECOWAS, warned it's ready to send up to 3,000 troops into Mali to make sure the transitional government recently set up by the junta remains in place for a year. VOA reports junta leaders reject the decision because they want to decide how long the interim government remains in power. It may make little difference. That's because what's left of the Malian government only controls about a third of the country. In January, ethnic Tuaregs and Islamist fighters, many of whom fought in Libya for ex-Libyan leader Moammar Gadhafi, launched a separatist rebellion to create their own country - Azawad. These rebels were so successful that angry Malian troops staged the March coup to demand better supplies with which to fight back. The northern rebels immediately capitalized on the coup d'etat confusion and within days, seized control of about two thirds of Mali, an area roughly equal to the size of France, reports the Christian Science Monitor. Human Rights Watch says civilians are suffering under the northern rebels control, with many human rights violations committed by the Tuaregs. In an upsetting report based on scores of interviews with witnesses, HRC says the northern rebels are forcing children into combat, committing mass rapes of women and young girls and looting - including stealing hospital mattresses from underneath patients. Medical workers are threatened at gunpoint. The rights group also says it has credible information that Malian troops have summarily executed Tuareg fighters and civilians.